With a particular focus on the field of singing and vocal production, Gwyneth uses Starways as a base to teach and lecture, as well as perform vocal repertoire. She runs teaches and runs workshops at starways with particular focus on the Alexander Technique applied to singing. She also works in nearby East London and does teaching and workshops in the Eastern Cape, Johannesburg, Pretoria and Cape Town. Individual Singing lessons are offered by Gwyneth Lloyd at starways arts centre and in East London. if you would like to book Gwyneth for lessons elsewhere please contact us for more information about times of year, she is free to travel to other parts of the country. Please visit our workshop page to find out more about vocal and opera workshops offered by Gwyneth and other starways musicians. Creating a beautiful balance of visual and performing arts, Gwyneth and her husband, Anton van der Merwe, have been engaging audiences and visitors at Starways ever since the early 1990's. Gwyneth now directs 'East Cape Opera Company', which draws it members from music departments at Fort Hare and Rhodes Universities, as well as local townships. The opera company performs opera recitals, a cappella ensembles and full scale productions. Invariably this includes performances at the Starways Rose Theatre on its annual tours throughout the Eastern Cape and has even travelled to The Netherlands. The opera company singers assist with the organisation of shows and the Company is the source of new and exciting Xhosa operas and music dramas, which highlight the fascinating history of the Eastern Cape. Gwyneth has raised funds from Arts & Culture institutions for supporting arts events at Starways, as well as in the local and wider community. Although - like Gwyneth herself - a growing number of her students have gained professional experience and tuition in Europe, the UK and USA, she firmly believes that artists also need to contribute to the survival of their own communities and cultures. Gwyneth Lloyd studied pottery as a hobby while pursuing a career as an opera singer, in London, uk, during the 1970’s. 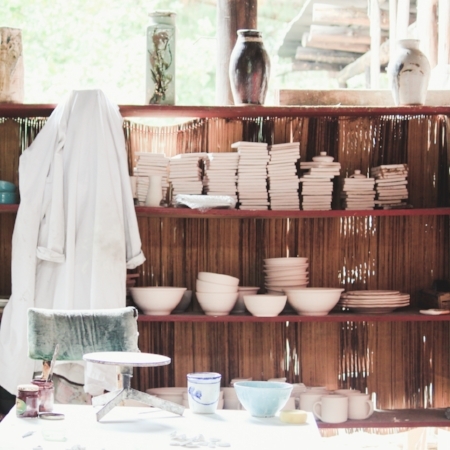 her love for and involvement in pottery was then rekindled when marrying potter, Anton van der Merwe in 1989. Having always lent a hand at the starways pottery since its founding in 1992, Gwyneth recently took it up more seriously after retiring from academic work at Rhodes and Fort Hare Universities. Her primary focus is on decorating dinner ware, garden pots and making ceramic jewellery. Vale studied An Ma In History Of Art At Bologna University, is an IANLP Certified Practitioner In Neurolinguistic Programming and has an ICF Certification Program Of Master In Personal & Business Coaching. After several years of living abroad, her African roots finally led her back home and she has been contributing top Starways for the past 15 years. Her focus is on hand building feminine shapes which she then decorates with geometrical patterns, often inspired by ancient Mexican and African designs. 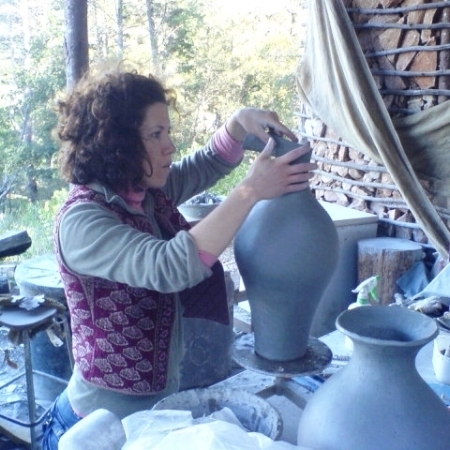 Liyanda mafika is a locally born hogsback resident who trained in pottery under starways co-founder anton van der merwe. his excellent throwing technique and incredible work ethic bring a quiet, but powerful energy to the starways pottery. Liyanda also plays a big role in the maintenance of the arts centre - without him, the place would literally fall apart! recently Liyanda has been collaborating with Gwyneth Lloyd, producing an entirely new direction in domestic ware, which can be seen at the Starways Shop. Pearce aka ‘Flooting Grooves’ has been mesmerising audiences since the mid 2000's with his unique brand of Psychedelic Trance. After studying flute at Rhodes University, Pearce set out to pursue music professionally and this journey has taken him to Amsterdam, Switzerland, Scotland, Turkey, Brazil, Russia and many other beautiful locations and yet somehow Starways always remained home and Pearce now continues to nurture his international producer/performer career, using Hogsback as a base camp. Trance evenings and mini festivals are a regular annual feature at the Starways Rose Theatre and Pearce is also pioneering a burgeoning trance scene in the Eastern Cape and South Africa. Eliot Lloyd Short Is a Multi-instrumentalist songwriter and composer living in London and regularly visiting Hogsback to spend time with his Starways family. Having worked in South Africa and Uk with a number of bands and projects, Eliot has a wide range of musical experience all of which comes through in his unique approach to composition, deeply influenced by his ethnomusicology studies at Rhodes University's ILAM. His compositions have been used for film, theatre and classical ensembles, being played at the British Film Institute, Trinity Laban, Bridewell Theatre, the Brunel Museum, St Bartholomew's the great, the Foundling Museum and in collaboration with the Modulus Quartet. Carrie van de Langenberg is the latest in a long line of apprentice potters at starways. 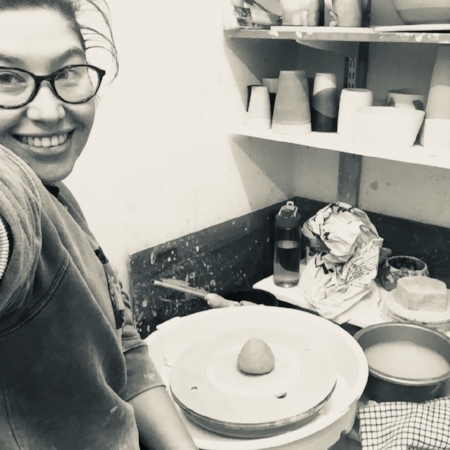 having taken a sabbatical from theatre and tv, in the uk, she started her pottery training at starways in dec 2017. while studying at starways, she also had the privilege of learning from master potter, John Steele. Carrie is continuing to throw, glaze and fire her own pots at a small studio in london and hopes to return to starways in march 2019. Willie Mafika worked as a potter at starways from 1994-1998 and in 2001 Starways assisted Willie and Liyanda Mafika in setting up their own pottery in Hogsback, with funding assistance of the South African Department of Arts and Culture. 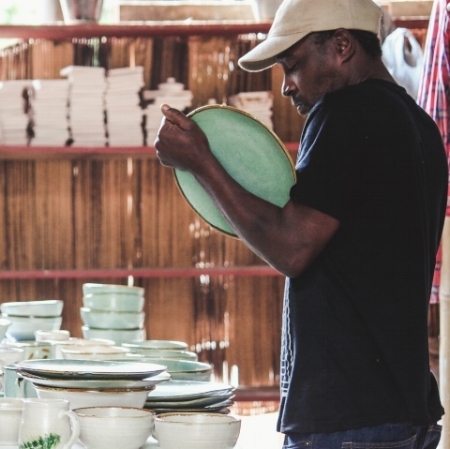 Starways and the Mafika Pottery are two of three fuel-sustainable potteries in South Africa and The collaboration between these two potteries is ongoing. Other visiting artists include: well known South African potters and ceramists John Steele, Steve Shapiro, Lesley-Anne Hoets, Yogi de Beer, Adi Carter and Mishak Masuku. Kathy Raven has been a regular artist at Starways for some time now and based up in Morgan's Bay it is almost as if she's local. Her and husband Brian bring amazing energy to the Starways whenever they visit and her intoxicating fusion of blues, pop and local South African flavour always pull in a crowd where ever she goes. Anthony Caplan has been a part of the starways music scene for almost two decades now! Collaborating with Gwyneth Lloyd in creating a brand new opera 'the moon prince', collaborations with Eliot Lloyd Short while both living in Joburg and also with Eliot and Pearce's very first band 'Infusions' back in 1998. Anthony continues to bring light love and more importantly amazing grooves with his guitar, percussion and vocal fusion of African, Brazilian, reggae and many other musical influences. Jamie Jupiter is a blues musician and entertainer extraordinaire. his ability to tell stories through music and engage crowds is second to none and his regular performances at starways delight and enthral audiences every time.